Recently acquired a 2004 Bongo, and the carbon mast & boom's exterior clear coat is flaking off in large swaths. 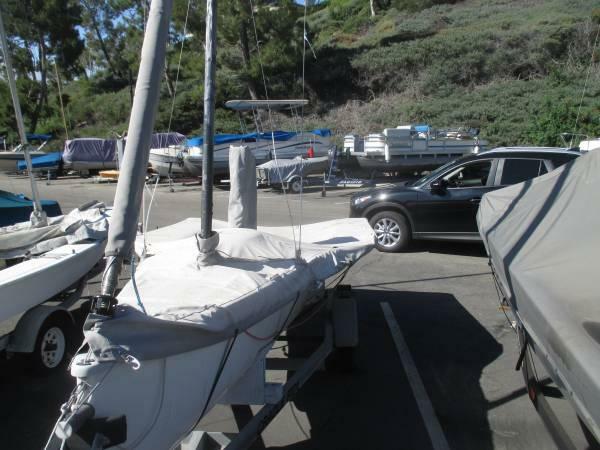 The carbon on both spars is in excellent shape, and I have covered the entire rig and hull now since acquisition. What would be my potential repair/remediation options? Best products to use? Bubbles and the clear coat flaking can be seen in the attached pic. Clear coat never lasts long . a paint finish , white awlgrip or similar , lasts forever . Best option is sanding and paint. If you do want the carbon look you can clear-coat but do yourself a favor and use a high quality clear like Awlgrip. The colored vs clear lifespan (using Awelgrip) is probably in the order of 2 or 3:1. I have had Awlgripped carbon sticks looking great for about 8-10 years before having to re-do. If you choose Awlgrip - follow the directions to the T or it will be severely compromised. Ahh the Bongo! Haven't heard anything about those things in years. Saw one sailing around Sarasota Bay sometime around 2004 or 2005 and never saw them since lol. Use razor blades to scrape old clear coat and sand (lightly). Wear a respirator, long sleeves and gloves. It'll be itchy. That will be most of the work. Solid color Awlgrip is the way to go. You can roll and tip to get a good finish, but spray is probably best. If you can, coat it indoors if in a controlled temperature environment to avoid variability in the finish due temperature changes, issues with bugs and dust, and issues with condensation causing it to haze if you leave it to dry overnight. Take a look at the 2k paints in a can. The Spraymax 2k Clear I have used works fantastically for a home job. If you can get a professional to shoot white Awlgrip that is a great option. We have masts here approaching 20 years old shot in white Awlgrip and the finish is holding up just fine. Looks like Lake Mission Viejo... Don't use razor blades. Wet sand with 220 and rattle can it w/Spar Varnish. Cheapest and easiest method. It will last if covered. If you don't cover it, paint as mentioned above to withstand the elements longer. You beat to it, don’t use a blade, just sand it properly. If its already flaking, razor blades are going to be quicker in getting the bulk of it off. It's lot of sanding otherwise and it seems like you end up removing more of the carbon. scraping is good, then finish with 220, once the fibers are exposed I suggest a flowcoat of epoxy as a base. You can either use a clear 2 pk primer over that or go to a varnish system, if clear primer then you can use a 2 pk clear to finish. In Cali it will last ok, if covered most of the time, maybe easier as less fairing is required. I'd suggest a clear UV resistant epoxy. I gave been researching the paints that have been recently developed that have great heat reflecting properties. I couldn't believe that Hugo Boss had black paint and decals on deck especially when these boats go through the tropics. I discovered that they use a special white primer underneath all the dark black and grey graphics to help with that. Seems to be this BASF product. I showed it to my mast builder who has convinced my client to paint his carbon fiber wing spar white but he was skeptical. He did a good job explaining how clear coat carbon was a liability in the long run for the spar and I have tried to come up with a compromise by suggesting that the spar get the BASF white heat sheild primer and then White Awlgrip as suggested by the mast builder and then we can apply some faux carbon boat wrap graphics with the boat name for a nice protective finish over the CF reinforcements and still get the 'look' of the clear coat carbon fiber that is all the rage. There is a reason why you don't see modern composite sailplanes in anything other than white! I’ve never, ever heard scraping used as a way to remove old 2 pack coatings from a mast. Just sand it properly with a machine, like any other pro would. It’s not difficult to gauge touching the carbon, far more control than a scraper. That sounds old practice from taking varnish of wood. Thanks for the link to the paints, interesting. But for the mast it Seems a lot of extra work and weight all for wanting a ‘clear carbon’ finish. Just paint it white and save time/money and weight. Just my thoughts on it. My mast builder was skeptical on the BASF product probably more for the cost than anything else. But when you are using high price structural materials like CF I think it would be a good idea to take any measures to keep the heat and UV to a minimum, especially for a spar destined to a service life in the tropics. I'll see what specifics I can find for the BASF products but the additive sounds promising. I first heard of these heat resistant coatings from where they were being used to paint shipping containers where they were being used for housing. I agree Christian, must be on top. White Awlgrip looks fantastic and lasts at least 25 years in more benign climates. Its my choice if you have one, but I'd rather have my rig protected than worry about the look. I've painted my carbon mast with Interlux Perfection 2 part polyurethane and it's amazingly easy to apply for the amateur (as opposed to Awlgrip) and looks great. I am thinking of re-clear coating a carbon fiber sprit. The clear is literally pealing off the sprit - which means there are areas down to carbon. Do I need a clear primer before applying a clear coat? Specifically, what primer if using Awlgrip or other quality marine product? I have removed paint before with a scraper as well as sanding. I have found scraping far superior because done right you only take the old paint off. When sanding you end up sanding into the carbon where the paint has already come off while trying to sand off the remaining paint/lacquer. It only takes a bit of care to get it right with a scraper.Flexible scraper like a box cutter blade works great. I have also done well on flat surfaces using a rigid tungsten scraper. It just depends on the shape of the surface which one is best to use. When all the old paint is off sand with 600 wet and dry and then clear coat with a good quality two pack clear . I did the same. Previously I had used a one pot vanish, and that lasted six or seven seasons. I am expecting longer from the two pot. For a small mast, there isn't that much work to sand and re-coat. the trick is to re-coat before it starts to peel. If spraying Awlgrip or other two-part polyurethane finishes such as Perfection, It's essential to use a supplied air respirator. Roll & tip puts solvent in the air while spraying puts droplets of paint in the air. The paint is quite toxic (cyanide compounds). If you must have a spray quality finish, get a pro to shoot it. de-rig the fucker and hang the rig in your garage instead of leaving it in the sun ? failing that, maybe after fixing up the finish, you should get another zip-up canvas sock for the mast.